Western blot analysis of HepG2 human hepatic carcinoma whole cell lysate probed with Mouse anti Human GAPDH antibody (MCA4740) followed by HRP conjugated Goat anti Mouse IgG, visualized by chemiluminescence. Mouse anti Human GAPDH antibody, clone 4G5 (MCA4740) used as a loading control for the evaluation of rat GAPDH expression by western blotting. Dnd1 expression. (A) Huh7 cells were transfected with a cloned GFP-Dnd1 construct and the cDNA was amplified by PCR. This was followed by KpnI restriction digest, to differentiate between the correct wild type and ter Dnd1 cDNA. (B) The GFP-Dnd1 fusion proteins generated in vitro were detectable with an anti GFP and an anti Dnd1 antibody. Both the 66 kDa wild type and the 60 kDa ter GFP-Dnd1 fusion protein could be identified. (C) qRT-PCR. Left: Dnd1 was transcribed in the gonads of animals at 3, 6 and 9 weeks of age. Higher levels were evident in testes compared to ovaries at all ages. Variable amounts were found in teratomas, ranging from high in TGCTs at 3 and 6 weeks, to low in TGCTs at 9 weeks and OGCTs at all ages. Right: Dnd1 expression of three ter/ter animals with unilateral TGCT was measured in both the teratoma and the contralateral degenerated testis. The amount of Dnd1 cDNA found in the teratomas was in the same range as wild type testes, while comparatively low levels were exhibited in the degenerated testis. The ter Mutation in the Rat Dnd1 Gene Initiates Gonadal Teratomas and Infertility in Both Genders. Mouse anti Human GAPDH antibody, clone 4G5 (MCA4740) used as a loading control for western blotting using HeLa cell lysates. YTHDF1–3 proteins negatively regulate post-entry HIV-1 infection in HeLa cells. (A-B) Overexpression of YTHDF1–3 proteins in HeLa cells significantly inhibits HIV-1 infection compared to vector control cells. (A) Overexpression of YTHDF1–3 proteins in HeLa cells was confirmed by immunoblotting. (B) HeLa cells overexpressing YTHDF1–3 proteins were infected with HIV-1 Luc/VSV-G at an MOI of 0.5 and viral infection was measured by luciferase activity at 24 hpi. (C) Overexpression of YTHDF1–3 proteins inhibits HIV-1 Gag protein synthesis in infected cells. HeLa cells overexpressing individual YTHDF1–3 proteins or the vector control cells were infected by HIV-1-Luc/VSV-G at an MOI of 0.5. At 24 hpi, the expression of HIV-1 Gag and YTHDF1–3 proteins (FLAG-tagged) was determined using immunoblotting. GAPDH was used as a loading control and mock-infected vector control cells were used as a negative control. (D and E) Individual knockdown of endogenous YTHDF1–3 proteins in HeLa cells significantly increases HIV-1 infection compared to vector control cells. HIV-1 infection assays were performed as described for panel B. * P<0.05, ** P<0.005, and *** P<0.0005, compared to vector control without AZT treatment. All results are shown as mean ±SD (n=3) and data presented are representative of at least three independent experiments. 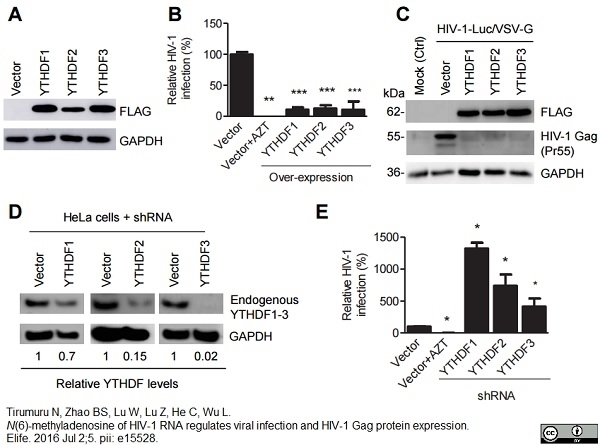 From: Tirumuru N, Zhao BS, Lu W, Lu Z, He C, Wu L.
N(6)-methyladenosine of HIV-1 RNA regulates viral infection and HIV-1 Gag protein expression. Elife. 2016 Jul 2;5. pii: e15528. YTHDF1–3 proteins negatively regulate post-entry HIV-1 infection in CD4+ 589 Tcells. (A) Individual knockdown of endogenous YTHDF1–3 proteins in Jurkat CD4+ 590 T cells was confirmed by immunoblotting. (B) Knockdown of YTHDF1–3 proteins does not affect proliferation of Jurkat cells. Jurkat cells (2×104) were seeded and cultured for 3 days. At the times indicated, cell proliferation was measured using the MTS assay. (C) Knockdown of YTHDF1–3 proteins significantly increases HIV-1 infection compared to vector control cells. (D) Individual knockdown of YTHDF1–3 proteins in activated primary CD4+ T-cells from a healthy donor. (A and D) GAPDH was used as a loading control. The vector controls without AZT were set as 100%. The reverse transcriptase inhibitor AZT treated cells were used as positive control for productive HIV-1 infection. * P<0.05, ** P<0.005, and *** P<0.0005, compared to vector control without AZT treatment. All results are shown as mean ±SD (n=3) and data presented are representative of at least three independent experiments. The m6A writers and erasers affect HIV-1 Gag expression in virus producer cells. (A and B) Individual or combined knockdown of endogenous METTL3 and METTL14 inhibits HIV-1 Gag protein expression. HEK293T cells were transfected with indicated siRNA, and then with an HIV-1 proviral DNA plasmid (pNL4-3). Cells and supernatants were collected for analyses at 36 hr post-transfection. (A) Expression of METTL3, METTL14 and HIV-1 Gag proteins in the transfected HEK293T cells was detected by immunoblotting. (C and D) Knockdown of endogenous AlkBH5, FTO, or both promotes HIV-1 Gag protein expression. HEK293T cells were transfected with indicated siRNA, and then with pNL4-3. Cells and supernatants were collected at 36 hr post-transfection. (C) Expression of AlkBH5, FTO and HIV-1 Gag proteins in the cells was detected by immunoblotting. (A and C) GAPDH was used as a loading control. Relative levels of Gag expression were normalized to GAPDH levels. (B and D) HIV-1 capsid p24 levels in supernatants were measured by ELISA. The relative levels (%) are also shown. * P<0.05 compared to the siRNA control. The results are shown as mean ±SD (n=3) and data presented are representative of three independent experiments. Mouse anti Human GAPDH antibody, clone 4G5 recognizes glyceraldehyde-3-phosphate dehydrogenase (GAPDH), a 36 kDa protein whose main function is to catalyse the reversible oxidative phosphorylation of glyceraldehyde-3-phosphate, in conjunction with inorganic phosphate and nicotinamide adenine dinucleotide (NAD). This reaction is an important energy yielding step in carbohydrate metabolism. GAPDH has also been shown to translocate to the nucleus under a variety of stressors, most of which are associated with oxidative stress, whereby it mediates cell death (Chuang & Ishitani 1996). GAPDH binds to several proteins responsible for neurodegenerative diseases, such as amyloid precursor protein and Huntingtin (Burke et al. 1996). Sun, S.Q. et al. (2012) Enhanced T cell immunity by B7-H4 downregulation in nonsmall-cell lung cancer cell lines. J Int Med Res. 40: 497-506. Northrup, E. et al. (2012) The ter mutation in the rat Dnd1 gene initiates gonadal teratomas and infertility in both genders. DeVallière, C. et al. (2015) The pH-sensing receptor OGR1 improves barrier function of epithelial cells and inhibits migration in an acidic environment. Am J Physiol Gastrointest Liver Physiol. 309 (6): G475-90. Shimizu, H. et al. (2016) Transgenic mice overexpressing nesfatin/nucleobindin-2 are susceptible to high-fat diet-induced obesity. Ellegaard, A.M. et al. (2016) Repurposing Cationic Amphiphilic Antihistamines for Cancer Treatment. Tirumuru, N. et al. (2016) N(6)-methyladenosine of HIV-1 RNA regulates viral infection and HIV-1 Gag protein expression. Elife. 5Jul 02 [Epub ahead of print]. Clark, P.A. et al. (2017) Resveratrol targeting of AKT and p53 in glioblastoma and glioblastoma stem-like cells to suppress growth and infiltration. J Neurosurg. 126 (5): 1448-60. Kim, J. et al. (2018) MicroRNA-378 is involved in hedgehog-driven epithelial-to-mesenchymal transition in hepatocytes of regenerating liver. Cell Death Dis. 9 (7): 721.